The other day I made Pecan Pie Larabars. They came out really good. I had some leftover pecans, so I wanted to try a Pecan Pie Granola. I love granola and eat it almost every day. It keeps me full until lunchtime, which is something that cold cereal could never do. 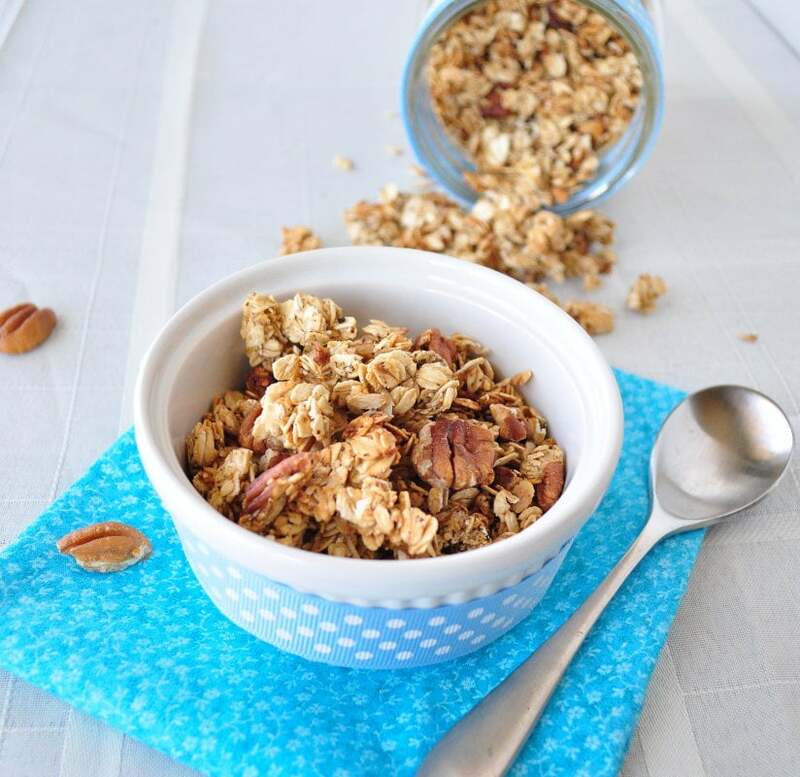 I was really happy with the outcome of this pecan pie granola so I am sharing it with all of you! This makes a great afternoon snack as well. I used ground vanilla bean instead of vanilla extract in this recipe and it really makes a difference. I buy it off Amazon and I love the stuff. We filmed a short video for this. You can view it below. For more recipes, you can subscribe to my You Tube Channel. In one bowl, mix the dry ingredients. In another mix the wet. Add wet to dry and mix until everything is coated well. 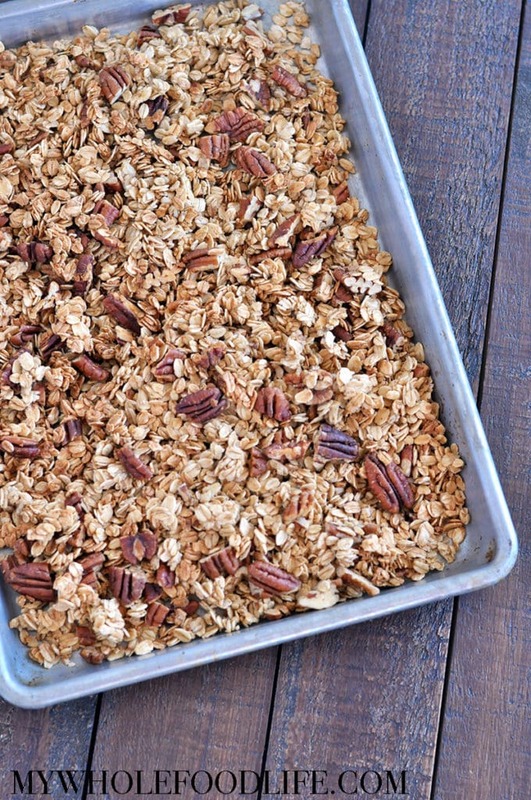 Spread granola out onto a lined baking sheet and bake for about 15 minutes. Pull the trays out and shake them around a bit and place back in the oven for another 15-17 minutes. Enjoy! This looks lovely, how funny, I made granola today! I make granola every other day. I have a bit of an obsession. It's just so good! This sounds good. I just bought a bunch or granola making supplies off amazon.com, I'll be making some soon. I like that you used apple sauce instead of oil. I've never thought of that. Thanks! I think oil is so unnecessary in granola. I agree. Can you freeze the granola and can you add other fruits? My son loves Apple Cinnamon anything lol. I haven't tried, but readers tell me you can. What brand of ground vanilla beans do you use from Amazon? There are a bunch of brands, and they all range so much in price! Thanks so much! Just discovered your site and so excited to explore and try the recipes! Does it still work to use vanilla extract? That's all I have, and I would really love to make some tomorrow! Thanks! Thanks! Just made it, and it turned out great! I added a Tbsp. of cinnamon too. YUM! How do you store this and how long will it last? Have you ever frozen it? I have not tried to freeze this, but I imagine it would freeze okay. I keep mine in the fridge and it lasts a few weeks. Have you tried using honey instead of the maple syrup? I have made granola before using honey and oil but I am thinking about trying it with honey and applesauce instead. I have not, but I am sure it will work just fine with honey. I'm going to try this one out...I spend so much money buying granola and figured I should try making it at home! Would I use unsweetened or sweetened applesauce for this? Love this! I am eating it right now. Easy, and the perfect texture -- I'm not fond of granola with huge chunks or that's too hard. Good call on the vanilla beans! I just discovered your site a couple weeks ago when we decided to "clean-up" our eating. I love the brussel sprouts recipe and can't wait to get home from work and make this granola! Oh, and the apple & pear quinoa sounds great. I'm definitely going to make this in the fall when we have pears again! What is a serving size ? How much vanilla extract would you use?